Well I got around to doing-it-myself finally this afternoon! As I was pranced around my room wearing it and trying it on with clothes, I really couldn’t see myself wearing it for real. And that was kinda the point. 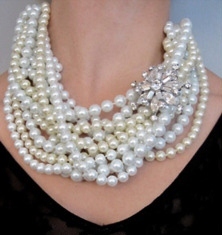 To remake/redesign my pearl strands so I’d actually wear them. So, I decided to try something different. I modified the design a tish and LOVED the results. I had noticed the strands kept twisting up as I was working with them. Annoyed before, I had kept trying to untwist them. But (post-DIY-fail) when I was experimenting, I gave in and let them curl into each other. The result was pretty cute! With some tweaking and prodding, I was impressed with what it looked like! 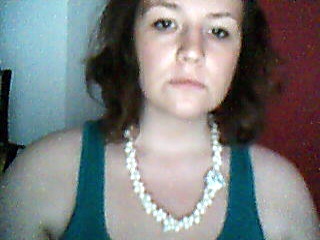 Even more exciting, I ended up with two necklaces! The lengths were uneven so they worked better as two separate pieces! 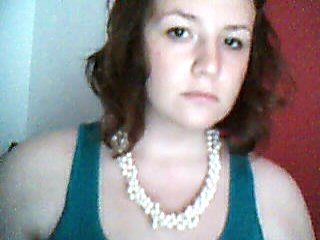 One is a plain pearl curl and the other has my broach as a garnish, is a little more flashy. I’m really excited about these new pieces! Can’t wait to find the perfect outfit to debut them with!